The Museum of Fine Arts, Boston (MFA), is partnering with the Boston Public Library to organize Toulouse-Lautrec and the Stars of Paris, a major exhibition opening in April 2019 that will explore Henri de Toulouse-Lautrec’s extraordinary attention to performance—particularly the stars and entertainments of 19th-century Montmartre, the bohemian center of Parisian nightlife. Both institutions house rich holdings of works by the artist, which are renowned for their bold colors and radical compositions. The exhibition will present more than 200 of Toulouse-Lautrec’s evocative posters, prints and paintings, including more than 100 works from the BPL’s collection—one of the largest-ever loans made to a single institution in the library’s history. 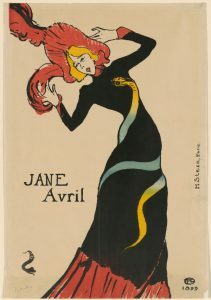 Throughout the month of June 2019, BPL cardholders can sample MFA membership by presenting their library cards at any ticket desk to receive free admission to the Museum (for two adults and up to six kids per visit) and a 10-percent discount in the Toulouse-Lautrec and the Stars of Paris exhibition shop. The collaboration will also feature a range of public programming offered at the MFA and the BPL throughout the run of the exhibition, including introductory talks in English, Spanish and Mandarin led by MFA Guides at the Library’s 25 neighborhood branches, as well as family-friendly activities taking place at the Museum. “Toulouse-Lautrec and the Stars of Paris” is organized by the Museum of Fine Arts, Boston, and the Boston Public Library. The exhibition is sponsored by the resort Encore Boston Harbor, located in Everett, MA. Additional support from the great-grandchildren of Albert H. Wiggin, the Cordover Exhibition Fund and anonymous funders. The exhibition will open in the MFA’s Ann and Graham Gund Gallery on April 7, 2019 and remain on view through August 4, 2019. MFA members will be the first to see Toulouse-Lautrec and the Stars of Parisduring the Member Preview, April 2–6, 2019. The exhibition examines how Toulouse-Lautrec pushed his art in new directions to portray the celebrity culture of his time—equally fascinated, much like today, with the performers’ personal lives as with the roles they played. Using brazen colors and expressive lines, the artist depicted the defining gestures, costumes and expressions of the celebrities of the day, many of whom were his personal friends. His images of performers—including cabaret stars Yvette Guilbert and Aristide Bruant, dancers Jane Avril and Loïe Fuller, and actress Marcelle Lender—contributed to their fame, distributed through prints and posters to an eager audience. Thematic sections will highlight the changing social and artistic landscapes of 19th-century Paris and the contemporary importance of prints and posters. The exhibition will incorporate works by Toulouse-Lautrec’s contemporaries Edgar Degas, Honoré Daumier, Pierre Bonnard, Edouard Vuillard and others—presenting him in the context of his heroes, peers and followers. An illustrated catalogue will accompany Toulouse-Lautrec and the Stars of Paris, produced by MFA Publications and released in April 2019. The publication will be available at the BPL’s Central Library and all neighborhood branches for perusal and checkout. In preparation for the exhibition, nine oversized posters have been sent to the Northeast Document Conservation Center (NEDCC) in Andover for extensive conservation treatment, framing and digitization; this work was jointly funded by the MFA and the Associates of the Boston Public Library. Five of these posters will go on view at the Museum, while the remaining four will be displayed at the BPL’s Central Library in Copley Square. Additionally, the MFA’s conservation team is undertaking the preparation and framing of more than 100 pieces from the BPL for the exhibition. Finally, the Library’s complete collection of more than 350 works by Toulouse-Lautrec has been digitized and is available on digitalcommonwealth.org. In addition to free admission throughout June 2019, BPL cardholders can reserve discounted passes to the Museum year-round through local BPL branches. These passes provide admission for two people at $10 each. This program is sponsored by the Museum of Fine Arts, Boston, and the City-Wide Friends of the Boston Public Library. As part of Encore Boston Harbor’s sponsorship, all residents of the resort’s host city of Everett will receive free admission to the Museum and Toulouse-Lautrec and the Stars of Paris with proof of residency throughout the run of the exhibition. The Museum of Fine Arts, Boston (MFA), is recognized for the quality and scope of its collection, representing all cultures and time periods. The Museum has more than 140 galleries displaying its encyclopedic collection, which includes Art of the Americas; Art of Europe; Contemporary Art; Art of Asia; Art of Africa and Oceania; Art of Ancient Greece and Rome; Art of Ancient Egypt, Nubia and the Near East; Prints and Drawings; Photography; Textile and Fashion Arts; and Musical Instruments. Open seven days a week, the MFA’s hours are Saturday through Tuesday, 10 am–5 pm; and Wednesday through Friday, 10 am–10 pm. Admission (which includes one repeat visit within 10 days) is $25 for adults and $23 for seniors and students age 18 and older, and includes entry to all galleries and special exhibitions. Admission is free for University Members and youths age 17 and younger. Wednesday nights after 4 pm admission is by voluntary contribution (suggested donation $25), while five Open Houses offer the opportunity to visit the Museum for free. The Museum’s mobile MFA Guide is available at ticket desks and the Sharf Visitor Center for $5, members; $6, non-members; and $4, youths. The Museum is closed on New Year’s Day, Patriots’ Day, Independence Day, Thanksgiving, and Christmas. The MFA is located on the Avenue of the Arts at 465 Huntington Avenue, Boston, MA 02115. For more information, call 617.267.9300, visit mfa.org or follow the MFA on Facebook, Twitter and Instagram. Encore Boston Harbor is a $2.5 billion five-star global destination gaming resort featuring 671 hotel rooms with sweeping views of the Boston skyline and Boston Harbor, an ultra-premium spa, specialty retail, award-winning dining, and state-of-the-art ballroom and meeting spaces. The three-million-square-foot resort will generate more than 4,000 construction jobs and 10 million labor hours, more than 4,500 permanent jobs, $265 million in traffic mitigation and approximately $660 million in direct annual expenditures from Wynn ($242 million in annual taxes and fees, $170 million in payroll and $249 million in goods and services to operate and maintain the resort). It is the largest private, single-phase development in the history of the Commonwealth. Situated on the waterfront along the Mystic River and connected to Boston Harbor, Encore Boston Harbor will open the Everett shoreline to the public for the first time in more than a century. The resort is spending $82 million to clean up the heavily contaminated site and create a six-acre park along the water which will feature pedestrian and bicycle paths that provide access to the harbor, an events lawn, picnic and public viewing areas, ornate floral displays and retail and dining experiences that overlook the Encore Harborwalk. The $82 million site cleanup was privately funded with no public funds being used. Guests and employees of Encore Boston Harbor can connect to points across the harbor via a robust water transportation system that the resort is introducing. Low-profile European-style boats will be used to sail back and forth without the need to raise area drawbridges. Encore Boston Harbor is expected to open in the summer of 2019.